NCX1 antibody LS-C16739 is an unconjugated rabbit polyclonal antibody to rat NCX1 (SLC8A1). Validated for ELISA, IHC and WB. SLC8A1 / NCX1 antibody was raised against synthetic peptide consisting of 18aa sequence within the N-terminus of mature rat NCX1 (KLH). Recognizes rat NCX1 (Sodium Calcium Exchanger). No significant sequence homology is detected with other NCX. Species sequence homology: mouse-100%, feline-77%, human, rabbit, monkey, bovine-72%, chicken-66%. Suitable for use in ELISA, Western Blot and Immunohistochemistry. 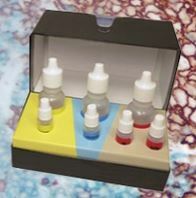 Immunohistochemistry (PFFE): 5-20 ug/ml. 4% paraformaldehyde. Store at -20°C for 1 year lyophilized.